Creating bespoke designs for special occasions is what Neill Strain Floral Couture is all about. In this blog post, Neill shares with us his fabulously feminine bouquets and arrangements fashioned with gorgeous spring blooms into stunning designs for women on these days of celebration. The month of March is one of the busiest times in the year in the life of a florist. International Women's Day is the occasion for which more flowers are sold worldwide than in any other single day during the year. Even more than Valentine's Day. This may seem surprising in the U.K. since International Women's Day is not celebrated as widely here as in Russia, the U.S. and some European countries. Nevertheless, in Belgravia, where we have many foreign clients, March 8th will be an extremely busy day for us followed shortly afterwards by Mother's Day on Sunday, March 11th and Arab Mother's Day on March 21st, the first day of spring. The theme for International Women's Day 2018 is #PressforProgress as activists are earnestly transforming women's lives with a global movement for women's rights, equality and justice. With this in mind, we created these beautiful "Chelsea" designs (above) in our 2018 Spring Collection. Created with glorious spring blooms including Mimosa, Lilac, Viburnum, Renunculi and Tulips alongside Roses and Skimmia, these bouquets and arrangements can be picked up or ordered at our Belgravia boutique and our concession at Harrods. They may also be purchased online. We deliver throughout central and greater London. Our "Knightsbridge" range is another option for International Women's Day. Designed with a spectacular array of spring blooms in the tints and tones of the season, the range includes a hand-tied bouquet, Petite Couture arrangements, a low table arrangement and an impressively tall design with real "wow" factor. Different size options for all the designs are available. Exceedingly feminine, these "Westminster" designs were created for both International Women's Day and Mother's Day. With Roses and Orchids blended with bright and fresh spring flowers, this range is truly exquisite. Again these bouquets and arrangements can be found at our boutique and at Harrods, or you can order them online. Whether it be for International Women's Day or Mother's Day, there are some women who prefer to deviate from the traditional pink. Hence, we have created the above "Mayfair" range with a mix of tropical blooms, Roses, Calla Lilies and Orchids in a striking orange colour palette. This range has a contemporary look that is particularly appealing to the modern woman. As we celebrate the 10th anniversary of Neill Strain Floral Couture in Belgravia this year, our "Belgravia" range expresses all the elegance and chic of our wonderful neighbourhood. 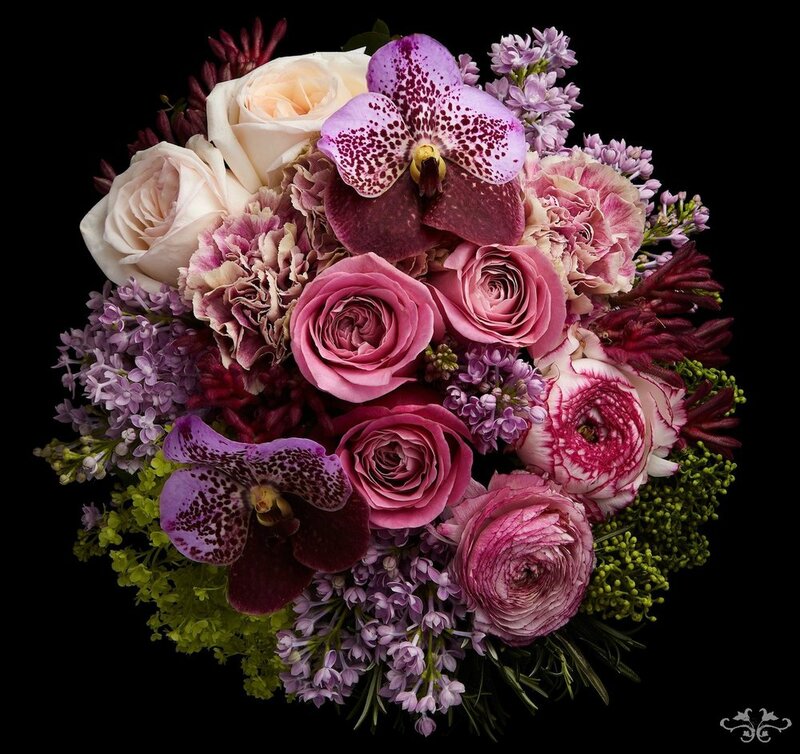 These designs, including Phalaenopsis, Cymbidium and Vanda Orchids together wth Roses, Renunculi, Dianthus and Lilac, in an enticing pink and purple colour scheme make the perfect gift for Mother's Day, from a small Petite Couture design to the impressive table arrangements or a simply gorgeous hand-tied bouquet. To complete our selection for both International Women's Day and Mother's Day, we have included two more hand-tied bouquets, "Buckingham" and "Nottinghill," and the Petite Couture arrangements, "Nottinghill." The "Buckingham" blooms are 80 cm tall Avalanche Roses in a pastel colour palette that can be ordered either as a hand-tied bouquet or in a glass vase to showcase the magnificent height of these blooms. In the meantime, to all women and mothers, enjoy this month of celebration, recognition and thanks for all you do in this world.